Benefits of black currant oilsupports healthy skin, joints, heart, moregood source of gamma-linolenic acid (gla),an omega 6 fatty acidnative to northern europe, the blackes from a shrub that produces tart berries, often used in juice and other beverages. These black-colored berries contain naturally-occurring nutrients like vitamin c and has been traditionally used for centuries for a variety of health issues. Today we now know that many of its healthe from its gamma-linolenic acid (gla),an omega 6 fatty acid important for supporting skin, immune system, heart, vision and more. Our black currant oil is non-gmo and gluten-free, usa country of origin, no preservatives, sugar, starch, milk, lactose, yeast, fish, artificial flavor or sweetener. * these statements have not been evaluated by the food and drug administration. These products are not intended to diagnose, treat, cure or prevent any disease. 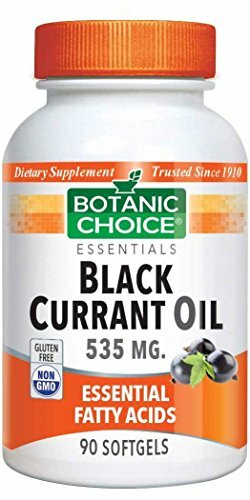 Botanic choice black currant oil 535 mg gla 80 mg - essential fatty acids support supplement - 90 softgels. Manufacturer: Indiana Botanic Gardens, Inc. Publisher: Indiana Botanic Gardens, Inc. Studio: Indiana Botanic Gardens, Inc. If you have any questions about this product by Botanic Choice, contact us by completing and submitting the form below. If you are looking for a specif part number, please include it with your message.